Airborne Radio Aries Airborne Radio for DCS World has the following features . 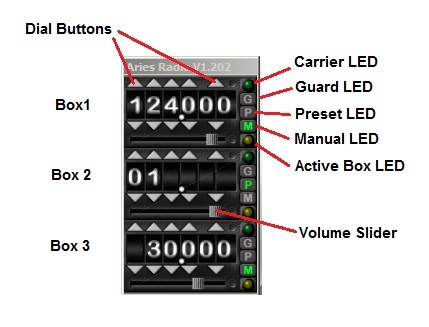 Full configurable for use with keyboard or HID compliant devices. Special Support for A-10C, KA50, UH-1H, FW-190D9, F-86F, P51 and MIG-21Bis. Radio communication for Flaming Cliffs on 3 Radio Boxes. Radio communication for Combined Arms on 3 Radio Boxes. God's frequency (Eavesdropper) for communication between players and non players. Voice encryption on demand in the A-10C via KY58. Air pictures from TGP by push on a button. Aries Radio was developed to have a radio communication system for all participants in the simulation. This includes aircraft, helicopter, ground vehicles and ground stations for ATC and GCI. The radios can be controlled by an additional small radio panel on top of the simulation window.If a clickable cockpit is available with the model used, the additional panel may be hidden and the control can be done with the cockpit instruments. Aries Airborne Radio is available as free download on the download page.